Ndamukong Suh talks Jimmy G, says Fins must "get him rattled"
After his first NFL start against the Arizona Cardinals, Jimmy Garoppolo has proved that be belongs in the league. He was almost perfect against one of the league's best defenses, posting over 250 passing yards and a passer rating of 106.1 (stat-speak for "exceptional"). 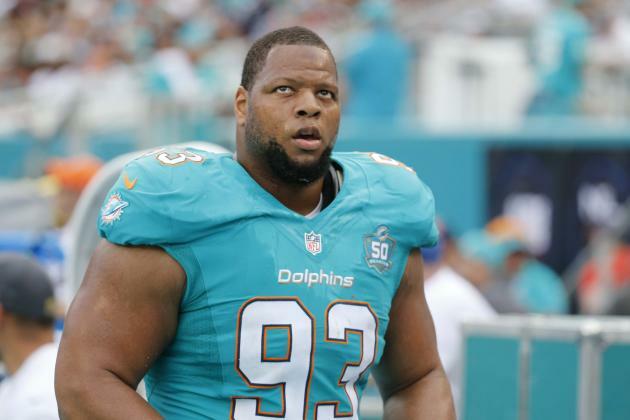 It looks like Dolphins DT Ndamukong Suh has taken notice--the polarizing veteran had some words for the virtual rookie Thursday, while mentioning that the Fins must "get him rattled" if they hope to pull out a win in Foxboro. Suh called Garoppolo a "very poised young man," but turned it into a backhanded compliment when he said, "He doesn't want to go out there and make any mistakes, and he went out there and accomplished that." Basically, the tackle just called him a game manager. While you could argue that Jimmy G is just trying to stay the course until Tom Brady returns from his unfair suspension, there's definitely more to the Eastern Illinois product than that. He cut up a star-studded secondary, converted key third downs, and even tossed a 37-yard TD through the air to Chris Hogan. To that effect, Suh said that Miami has to "go in there and get [Garoppolo] rattled" if they want to have any shot at a win. Sun's key to victory: "get him moving around, get him off his spot and make him uncomfortable." There's only one problem: That's pretty much what the Cardinals tried to do, and they have an 0-1 record to show for it. Garoppolo may be a practical rookie, but he is a lot more mobile than Brady, and has shown the requisite poise to command crucial drives against one of the NFL's top defenses. Though he's not a carbon copy of Brady (nobody is), Jimmy G does have skill in his own right--far more than the "game manager" label suggests. The Patriots won last week because of Garoppolo, not in spite of him. It might do Suh well to recognize that fact before the Pats' QB makes it clear to him personally on Sunday.